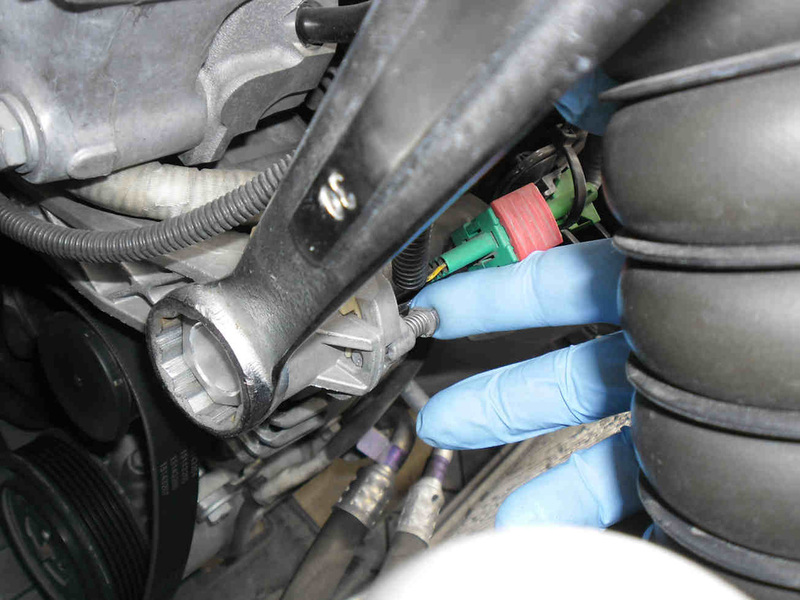 If you're replacing your automatic tensioner, be aware that it is supplied pre-loaded. Do not hurry up to take out the pin. You can hurt yourself and damage the tensioner. See below. 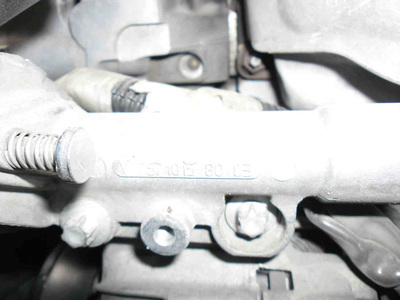 These works concern an EP6 engine found on many Peugeot, Citroen and Mini vehicles. 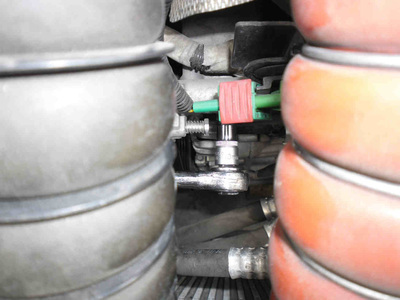 Belt tensioners with arm are very similar on other engines. 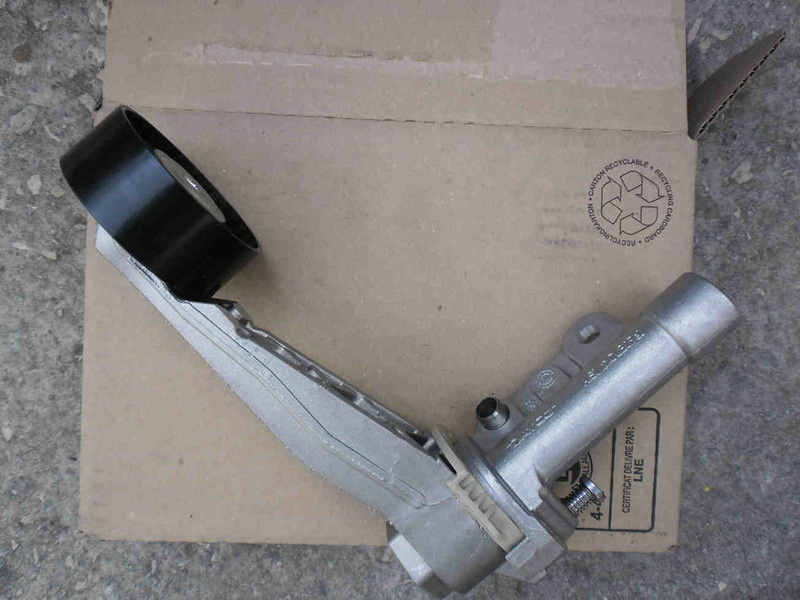 The tensioner is made out of two parts: the body, fixed to the engine (right part of the pictured tensioner) and a moving arm that is perpendicular to the body (the one in my hand). The moving arm is continuously pushed down by a powerful spring unless it is held up by the pin in the middle of the picture. Pulling out the pin will automatically lead to the arm swiveling down. 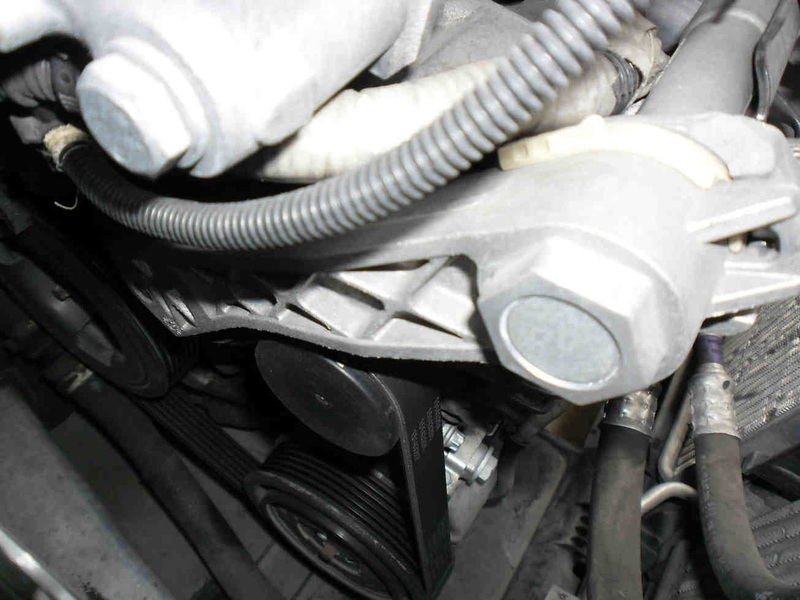 For this reason the pin should remain in place until the tensioner is fixed to the engine and the belt is in place. Other dynamic belt tensioners do not have an arm. The spring loaded wheel pivots directly on the tensioner body. The body is round because it houses the spring and is made of two parts that turn on each other. The tensioner in the left picture is pushing down the accessory belt thanks to the strong spring of its arm. 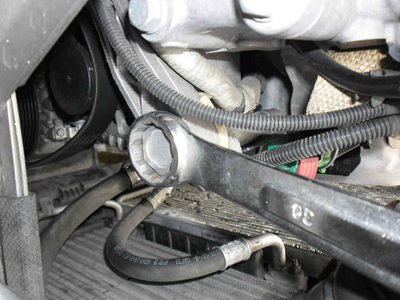 Use a spanner to rotate the tensioner in a manner to take it away of the belt. The belt can be seen loose in the middle picture. Use your finger to push the pin in which holds the arm away from the belt (right picture). You can now safely dismantle the tensioner from the engine. The tensioner is fixed to the engine by a couple of bolts. Use a ratchet handle to unscrew them and remove the tensioner. ​Do not do so unless you blocked the arm as shown above! Reverse the above steps for fixing back the tensioner. Make sure the belt is well in place before taking out the pin for releasing the spring actuated arm.